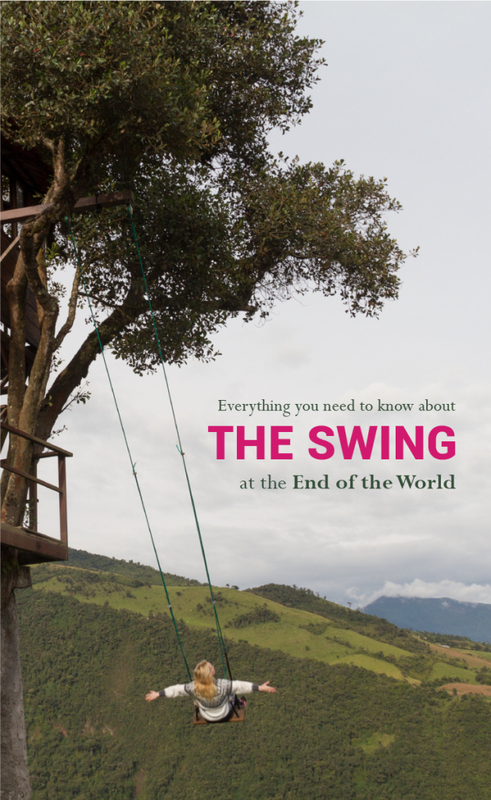 You have probably seen pictures of the swing at the end of the world. 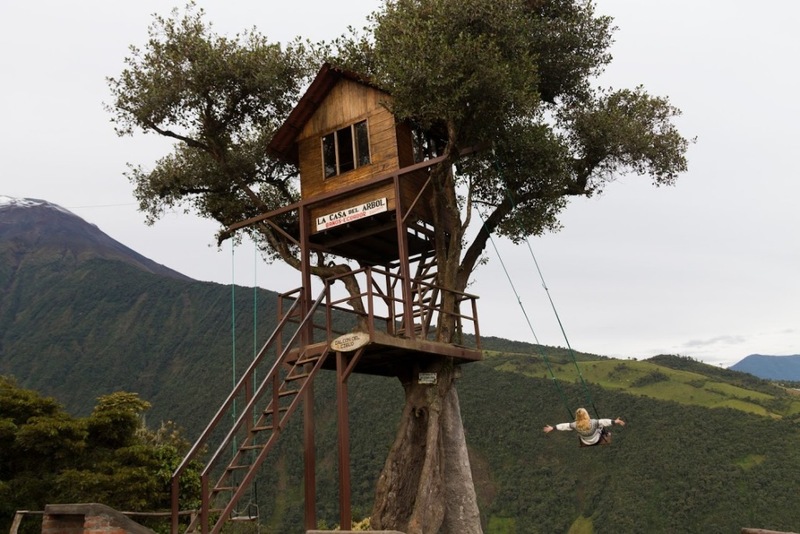 That swing is in Baños, Ecuador. 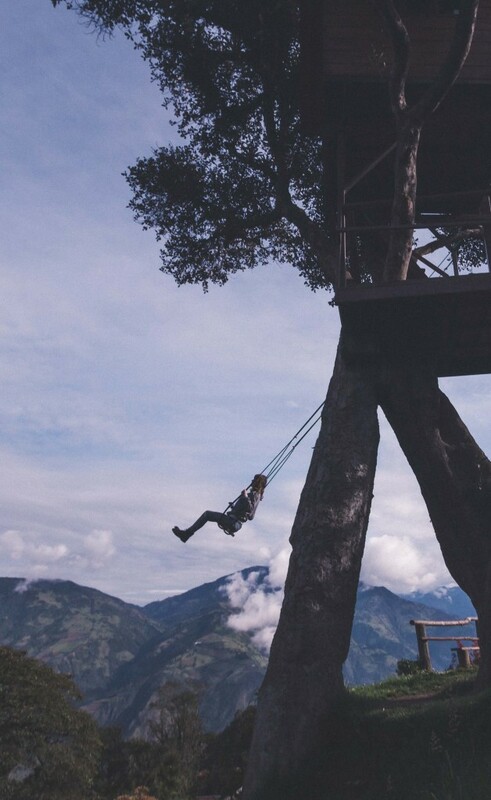 In the last couple of years, this city got famous because of the Casa Del Arbol Swing, especially among millennials. Baños was famous before that for its hot spring pools and waterfalls. Baños is considered at the entrance to the Amazon. You will notice this by the lush landscape. 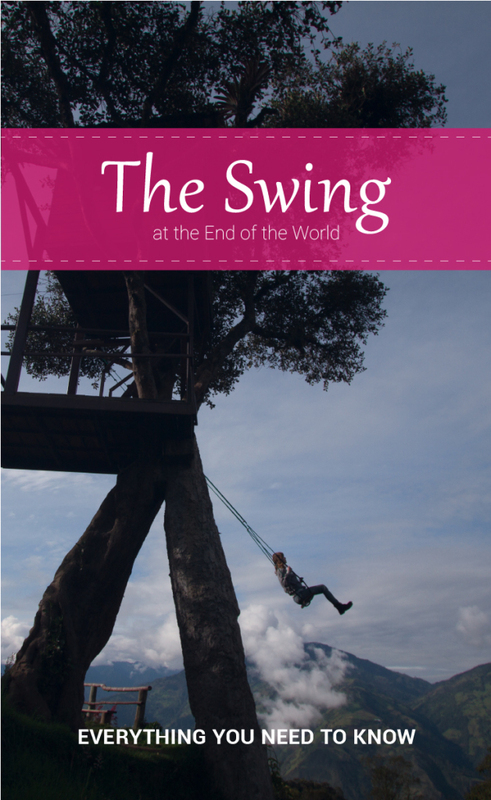 The swing can look terrifying and you might think it would be a big risk to take it? Don’t worry, you won’t fall off the earth! 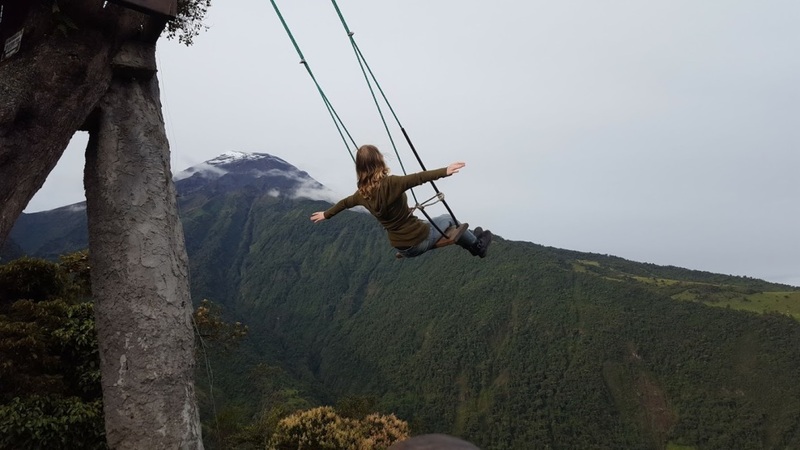 If you decide to take the swing you might see lava from the active volcano Tungurahua. Casa Del Arbol means the Tree House and it used to be a tower where some workers were watching for fires and eruptions from the volcano. It costs $1 to enter the area to take the swing. 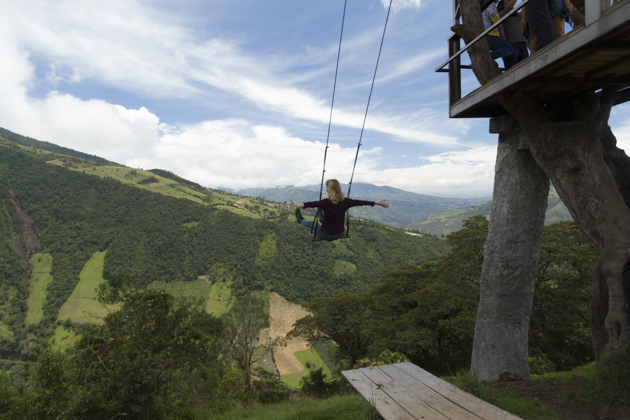 The swing is located in Baños in Ecuador. Next to Tungurahua volcano on a hilltop. Return: 0800 am (only weekends), 1 pm, 4 pm and 6 pm. The bus costs $1 one way. When we went there on a Monday we were able to take the bus at 0545 but not back before 1 pm. So make sure to get a taxi if you don’t want to stay there that long. You can always get a taxi to and back from the swing. When I was there not so long ago we got there at 6 am on a Monday, low season. If you want to have the swing for yourself and get awesome photos! Go that early and off-season on a weekday. 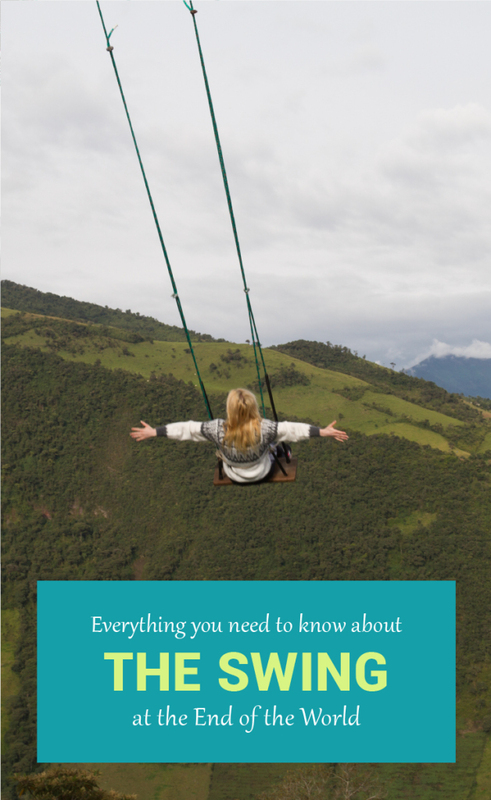 The weather in Ecuador and especially the mountains is very unpredictable, therefore you are taking a risk if you go there during the afternoon. It will most likely be cloudy, foggy or even rain. If you go during the weekend around mid-day it will be packed no matter what and even a queue to take the swing. If you go earlier in the morning it is a better chance to see the volcano as well. Think about what to wear. Wear clothes that will make you stand out, not green like underneath. Be sure to bring a thick rain jacket. It can get pretty cold up there. Here you can see a glimpse of the Tungurahua volcano. If you get there early, you will have plenty of time to try different angles for taking a photo. Pailon del Diablo. You haven’t been to Baños if you haven’t seen this waterfall. It is breathtaking and it will remind you of the Lord of the Rings. To see this you can either rent a bike and make sure you get a map or use google maps. 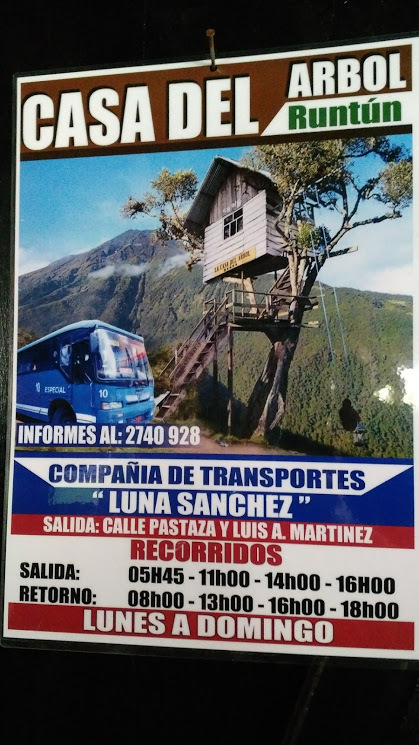 Or you can take a Chiva bus and join the Ruta del Cascadas tour that takes roughly 2 hours. Baños is magical. It is like an Amazon fairytale. 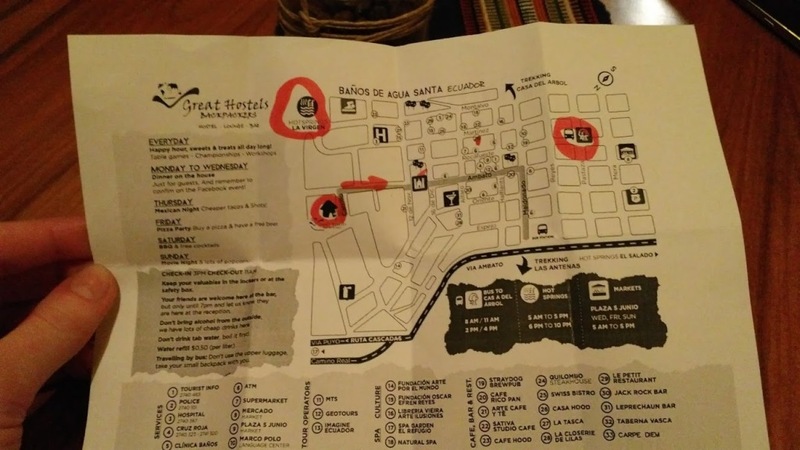 A town that is perfect for Instagram pics. 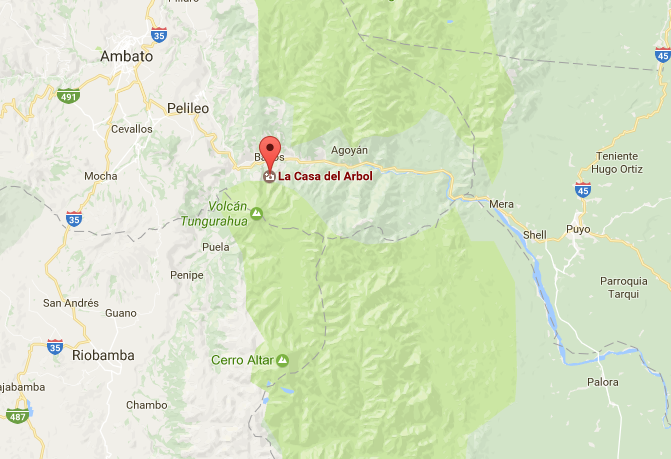 Starting at Casa Del Arbol in the morning and Pailon Del Diablo in the afternoon. In only two days you will have plenty of time to take the perfect photos at Casa Del Arbol and Ruta del Cascadas. 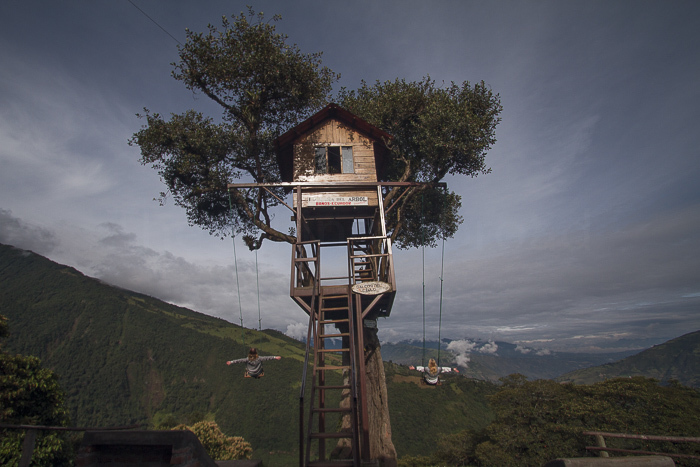 Would you take the swing and visit Baños?